This is a truly fabulous tray as you would expect from a piece by Louis Prodhon. 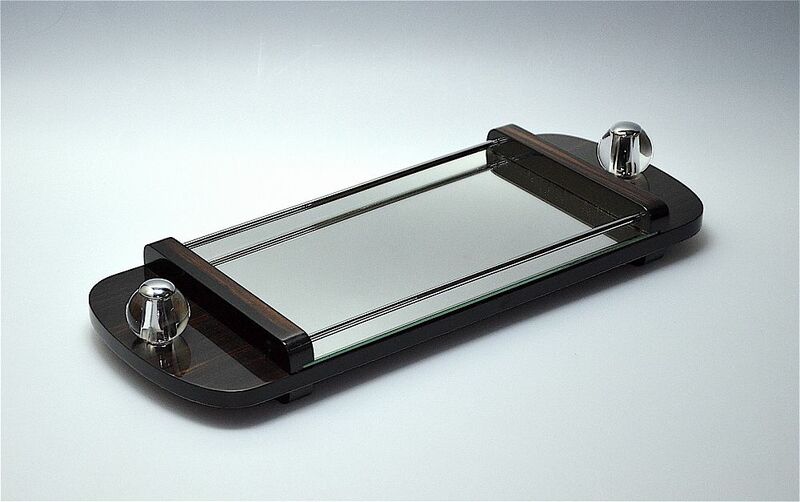 The round ended rectangular base is of macassar ebony with ebonised sides with ebonised feet. The base has three sections, the two D shaped sections at each end are separated from the middle section by a raised macassar ebony bar with ebonised sides. On each of the D shaped end sections is a round glass ball with a chrome centre capped by a chrome disc. These glass balls act as handles. The middle section is in mirrored glass bordered on the 2 long outer sides by round chrome tubes that attach to each end of the two macassar bars.